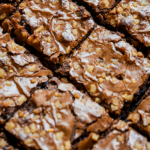 Quick and easy, this dessert compliments both the beer and nuts used in this recipe. Sleigh’r draws out the tannins in the walnuts and pecans, complimenting each other’s dry finish. The bitterness of the cocoa is balanced by the maltiness of the beer and offers a sweet, toffee flavor. 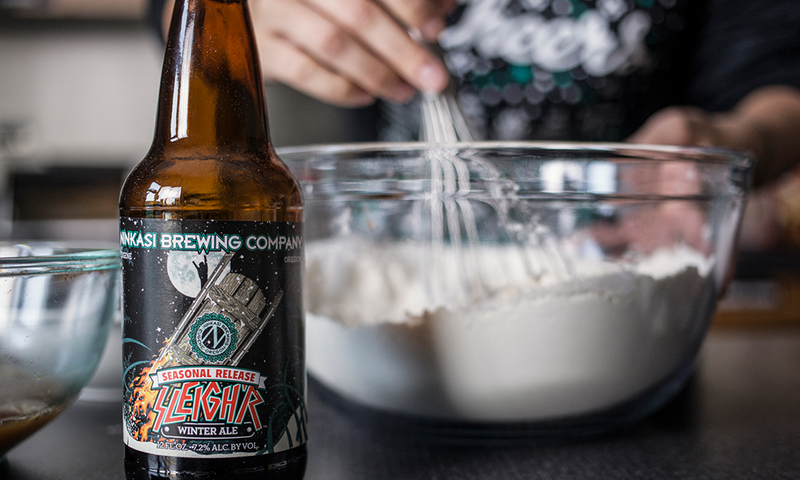 Pour a 12 oz Sleigh’r into a medium saucepan. Cook over low heat until it reduces to a syrup –usually takes 15-20 minutes. Stir it occasionally to avoid burning. If it foams up, remove the foam with a spoon and discard. Allow reduction to cool to room temperature. Mix dry ingredients together. In a separate bowl, mix liquid ingredients together and then add to dry. Roll by hand into small balls and then roll in powdered sugar. Serve!